This Impex Stuttgart cast brass 6 light Strass crystal chandelier in gold plate is traditional and stunning. Boasting a circular ceiling cup and chain suspension, with gold plated frame featuring eight candle style lights. The detailed cast scrolled arms feature filigree candle drips decorated with hanging faceted Strass crystal buttons and drops. The whole chandelier is dressed with a mass of strung faceted octagons and heavy half-spear point drops to create a mesmerising display. This is an opulent luxury chandelier that wouldn’t look out of place in a vintage, classic or traditional room and is a great source of illumination. Capture the glittering ambience of the Starlite Prestige lighting collection in any space whilst adding a focal point to any ceiling. Please note: The image shows the eight light version of this stunning chandelier as there is no image of the six light available at this time. The eight light is identical in style and finish to the images shown but features two fewer lights and is a little smaller in diameter. The height given below is for the fitting only, which is supplied with 50cm of chain but can be supplied with any length. Please contact us for this option. There are coordinating twelve and fifteen light chandeliers and a double wall light available in the Stuttgart crystal lighting collection that can be viewed below. 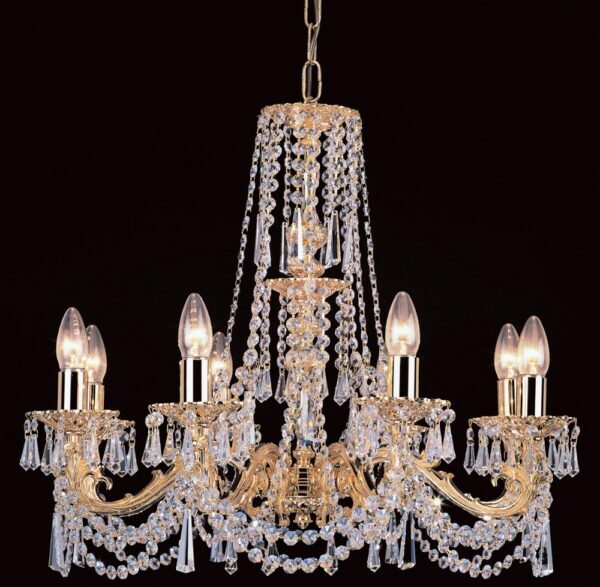 Impex Lighting are one of Europe’s leading manufacturers who supply a comprehensive ranges of fittings in contemporary, traditional and classic styles like the Stuttgart cast brass 6 light Strass crystal chandelier in gold plate featured here.